Former St. Louis Blues player Dallas Drake, who won a Stanley Cup this season with the Detroit Red Wings, announced his retirement after 16 seasons. 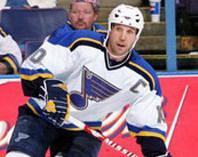 Drake played six seasons with the Blues from 2000 to 2007. The Blues bought out the contract of Drake after the 2006-2007 season, opening the door for Drake to sign on with Detroit. The 39 year old Drake was originally signed by Detroit and was the Blues captain in 2005.